Students have to look at the pictures in this interactive flipbook and find clues to figure out what the person could be thinking. They have to site the clues on the page that helped them come up with a "social inference". Common core aligned and a perfect way to work on social skills as well as pre-cursor reading skills to work on inferencing! Just print on cardstock, laminate, punch holes and attach with binder rings. Students use dry erase markers to write there answers! 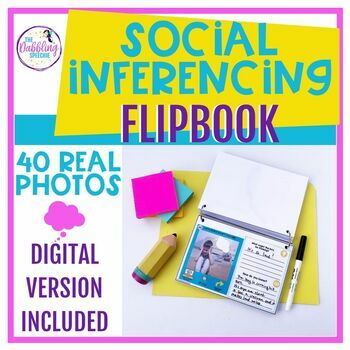 Grab this flipbook in my TPT store!